UPSC CDS Written Exam Result 2019 declared: The written exam was held on February 3. A total of 7953 candidates have qualified for the interview round. UPSC CDS (I) Written Exam Results 2019: Union Public Service Commission (UPSC) has announced the result ofcombined defence services at its official website. 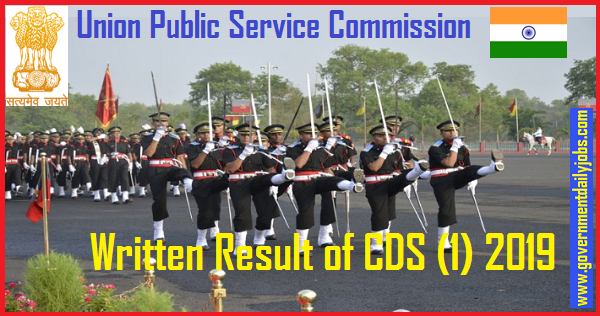 UPSC CDS 1 Written Exam Result 2019: Union Public Service Commission (UPSC) has announced the result of Combined Defence Services (CDS) 1 Result 2019 at its official website www.upsc.gov.in on 09 April 2019. Candidates who have appeared in the CDS 1 Written Exam 2019 can check their results at the official websites at upsc.gov.in. CDS (1) 2019 Written Exam Result: Qualified candidates as per the UPSC CDS 1 Exam Result 2019 will have to submit the original certificates in support of age (Date of Birth), educational qualifications, NCC and other certificates as per requirements. Candidates should note that all the candidates who have successfully qualified in the written exam are required to register themselves online on the Indian Army Recruiting website joinindianarmy.nic.in within 2 weeks of announcement of written result. UPSC CDS -1- 2019 Written Exam Result: It is to be noted that the UPSC CDS written exam was held on 3rd February 2019. On the basis of the performance in the written exam, a total of 7953 candidates have qualified for the interview round. The successful candidates finally will be considered for admission to (1) Indian Military Academy, Dehradun 148th Course commencing in January, 2020 (2) Indian Naval Academy, Ezhimala, Kerala, Course commencing in January, 2020 (3) Air Force Academy, Hyderabad (Pre-Flying) Training Course (207 F(P)) commencing in January, 2020 (4) Officers Training Academy, Chennai 111th SSC Course (NT)(for Men) commencing in April, 2020 and (5) Officers Training Academy, Chennai, 25th SSC Women (Non-Technical) Course commencing in April, 2020. According to the UPSC CDS 1 Result 2019 notification released by the Commission, the marks-sheet of candidates who have not qualified, will be put on the Commission’s website within 15 days from the date of publication of the final result of OTA (after conducting SSB Interview) and will remain available on the website for a period of 30 days. UPSC CDS I Written Test Result 2019: Union Public Service Commission has recently conducted the Examination of Combined Defence Service Exam I (CDS I). It was scheduled on 03/February /2019.There are total 417 posts for which Exam was conducted ,45 posts are for Indian Naval Academy & rest 327 posts are for Officers Training Academy respectively. UPSC CDS I Written Exam Result 2019: It is hereby informed that UPSC CDS II Result is been released now, Result List has been displayed on the portal; they are required to check their details in the list. For Indian Military Academy, Indian Naval Academy & others defence academies hiring will be done by this Examination & various dignified defence academies over the country they will commence their Courses by this selection & Recruitment procedure. Selected candidates will be called for Interview which is Second Stage of Selection, total 7953 candidates are qualified in Written Examination and so that they have to appear in CDS I interview Proced. 1. In order to download their UPSC CDS I Result candidates are required to go to the important link section provided below. 2. After getting the link candidates need to click it for downloading their UPSC CDS I Result. 3. Candidates will find their Written Examination Result List, containing their Roll No. for the various Academies respectively. 4. Candidates can also download their UPSC CDS 1 Result from official site of the UPSC.